What is my favorite teacher gift for the holidays? Coffee in all forms. Coffee is a great gift for the coffee lover especially if they love trying new flavors because buying it at a coffee shop day in and day out can be expensive. 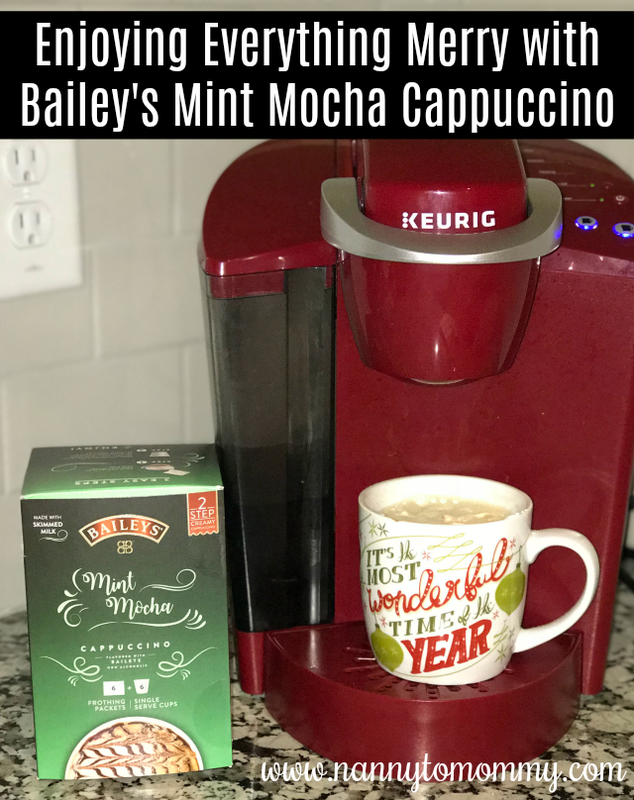 And now you can have a hand crafted cappuccino anywhere with Bailey's Mint Mocha Cappuccino K-cups. Simply pour the powder packet of frothing milk into your mug or glass and brew the single serve coffee cup then stir. Zesty mint, dark chocolate, and bold coffee--this playful combination is a treat for the senses. Brewed into an indulgent and creamy cappuccino, few flavors are more enjoyable. Savor the balance of refreshing and rich, warm and cool, bitter and sweet. It’s a study in contrasts you’ll want to reexamine time and time again. This box will arrive as 36+36 unit. The retail value of this product is approximately $49.95. You can purchase on Amazon.com. One VERY LUCKY Nanny to Mommy reader will win a 36 ct Bailey's Mint Mocha Cappuccino. Entry is simple, just follow the prompts on the Rafflecopter below. Open US only, must be 18+ to enter. Winner chosen via Random.org through Rafflecopter. All winning entries are verified. Please follow us on Facebook to stay up to date with our current giveaways. Good luck! 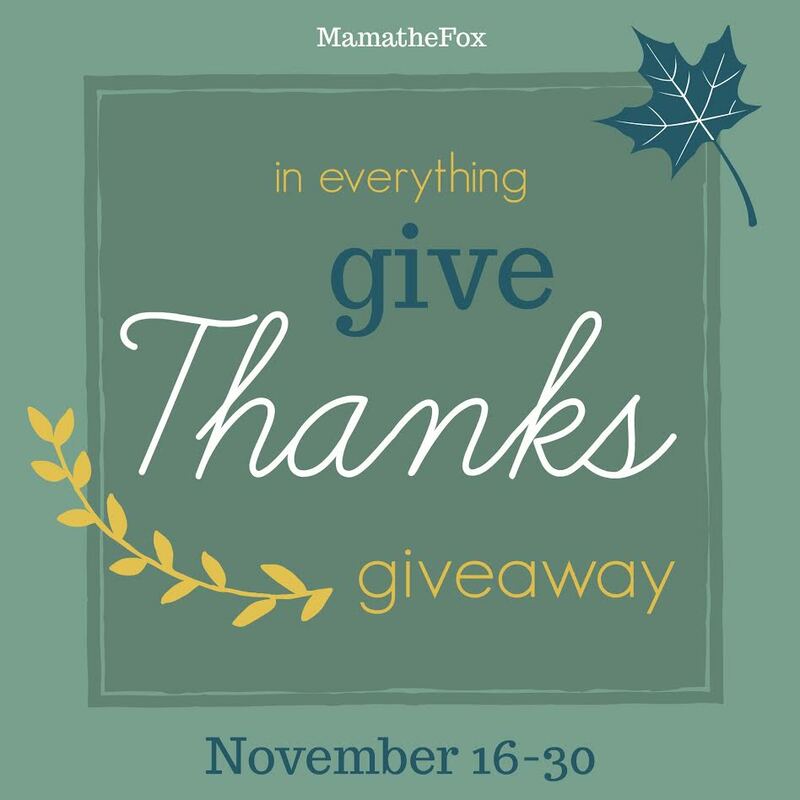 Welcome to the "In Everything Give Thanks" Giveaway Hop. This hop is hosted by MamatheFox. Come join the fun and enter to win a family friendly prize! There is no limit to how many prizes you can win so visit each link for more chances! MamatheFox and all participating blogs are not held responsible for sponsors who fail to fulfill their prize obligations. Nanny to Mommy received complimentary products to provide this post. All opinions are my own. This post contains affiliate links. Facebook, Twitter, Pinterest and any other social media are not affiliated with this giveaway. 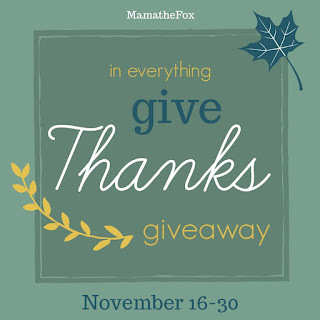 Nanny to Mommy and participating "Frightening Fun" Giveaway Hop bloggers are not responsible for sponsors who do not fulfill prize obligations. This giveaway is open to US only, must be 18+ to enter. Cannot be shipped to P.O. boxes. One entry per household/IP address. No social media was involved in this giveaway in any way. Winner is chosen via Random.org through Rafflecopter. ALL winning entries ARE verified. Winner will have 48 hours to respond with all information in email or another winner will be chosen. If you would like to see your product featured on our blog or sponsor a giveaway event, please contact us. I would like to try Bailey's K-cups because I love,love love coffee and the flavors that they have look delicious. I want to try them all,especially the caramel,Yum!! This would be very comforting on a cold morning! I never tried any K-cups before! I haven't tried it so I think now would be the perfect time to try them! Yum! I have not tried these yet but I like the 4 flavors that are shown. I like a cappuccino on occasion but don't drink flavored coffee. They look very good, and I would think they would be so comforting on a cold day. I would love to try these because I love Bailey's and I love cappuccino. IT would be a great way to start the day! I'd love to try these because Bailey's and coffee has always been my go-to drink. If only airlines didn't serve it in those styrofoam cups. I would like to try these because I would love a treat in the afternoon with a cookie. I like Cappuccinos a lot more than coffee and I like trying new flavors. This is one of my favorite flavors!! I used to have Kahlua and Bailey Irish Creme - delish!! I love trying new flavors for my keurig. I would share it with my daughter. Oh WOW! Baileys has a K-cup?? These look delicious! I'm a fan of Bailey's already. So this must be soooo good!! I would like to try them because I have a new Keurig that they would work well with. Thanks for the giveaway! I love Bailrys so I think this drink would be amazing to try on a cold morning! I would love to try the french vanilla! Love all the flavors listed though. I am the biggest Bailys fan and also I dig cappuccino. A dream pairing. I would like to try these because they sound good, and I've been looking for some new brands/flavors to try with my Keurig. Because I love warm drinks! I would love to try any of these delicious flavors. They are perfectly sweetened and expertly flavored and sounds great to me. I would love to try these because I bet they taste great. I would love to try the French Vanilla flavor. I would love to try it because I love Bailey's! i love to try this br cause well hay it's coffee and as long as its not decaf its for me and well its godd for me as well. I love Bailey's and coffee so I'm sure this is just as yummy! I would like to try the Bailey's K-cups since I haven't yet, they look like they'd be good! I would like to try these because I love coffee and am always excited to try new and different flavors. We would love to try Bailey's K-cups because we love coffee all 4 of us in our home and drink many cups a day and these sounds so good. I use my Keurig all day long! Especially now that it's getting cooler in the evenings, I enjoy a sweet treat before bed. The mint mocha sounds AMAZING! I have not tried them before and they sound tasty. I've recently became a lover of coffee and these sound delicious. Thanks for the chance to win. One, I love coffee and drink it every morning; it is what gets me out of bed. These sound dark yet, rich and smooth ~ drooling here.